I am not Catholic. I have attended mass and respect the Catholic Church. Travis and I actually had an opportunity to be in Rome in March 2013 when Pope Francis was selected as the new Pope. We are still kicking ourselves for not going on that trip. As a liberal Christian, this man speaks to my earth loving, take care of others heart. The book Encountering Truth is an assembly of homilies from Saint Martha’s Church beginning in March 2013- May 2014. Dates and passages correlate with the homily. 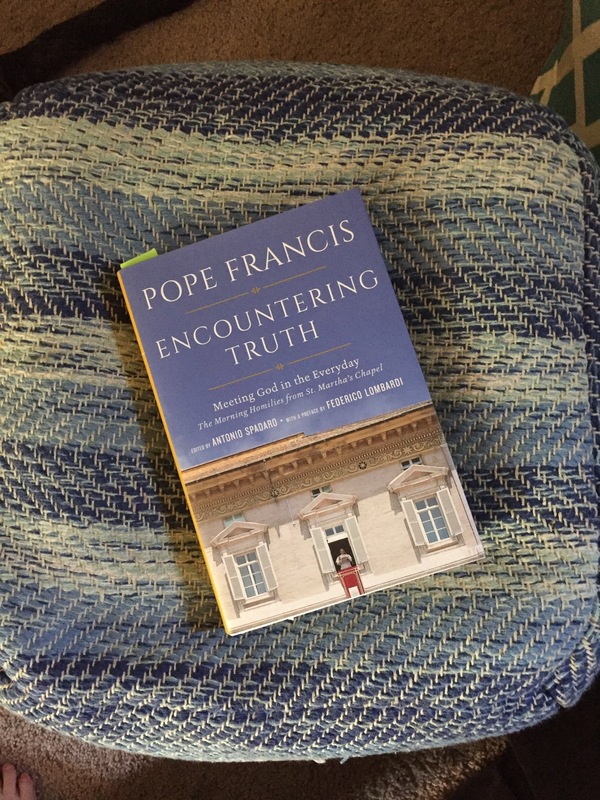 I like these because they are short, easy to read and they give the reader, who may or may not be Catholic or even Christian the opportunity to see what the Church and this Pope are all about. As a born and raised Protestant, the idea of the Holy Mother is a bit baffling but I love the comforting way he speaks about her and her as the church body to comfort and care for the people. This isn’t a sit down and read it in a day or week book. This is something you soak up over time, slowly. I keep this on my side table by my sitting chair and read a few homilies before I journal or pray. The Pope doesn’t prepare for these speeches, they are off the cuff and liturgical. Speaking from his heart and some might say from the Lord, Himself.